Help Provide over 250,000 meals this Fall. Help the homeless and needy by being a part of the Pack the Pantry Food Drive. You, your business, school, organization, or place of worship can help the hungry and homeless with meals and more! During these uncertain economic times, we need your help more than ever to serve the hungry and homeless of South Florida. 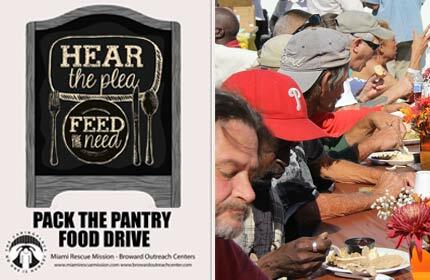 During the fall, our Centers in South Florida are having the Pack the Pantry Food Drive campaign. We want to raise enough food to help us feed nearly 220,000 meals to the hungry and homeless of our communities this fall. This includes our Great Thanksgiving Banquet as well as our Christmas Outreaches. Hope often begins with a meal! 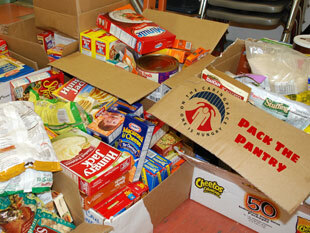 Organize a Food Drive at your school, business, place of worship, or with a group. Simply fill in the form and we will send you our Pack the Pantry grocery bag(s) (pictured at top).For larger donations we can provide flyers to place on large boxes you provide. 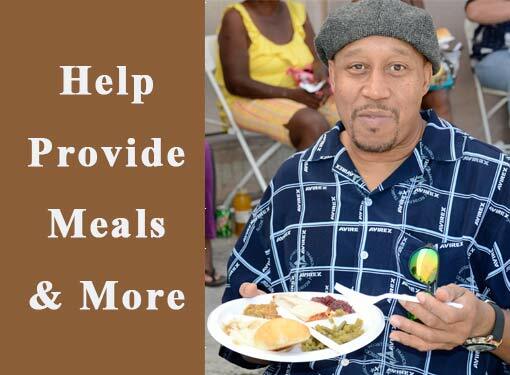 Your food donations will provide nutrious meals to those in need and will help change lives.